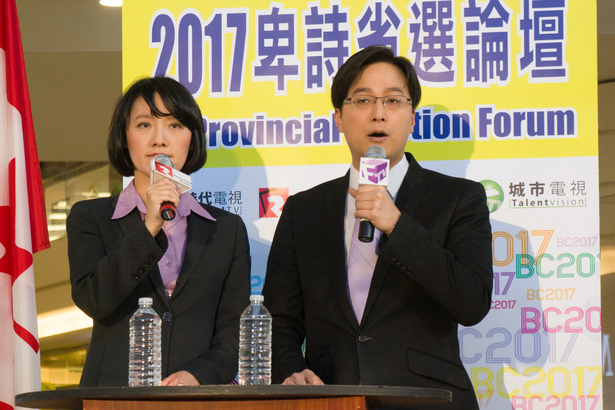 BC Provincial Election Forum 2017, organized jointly by Fairchild Radio and Fairchild Television, was successfully concluded on April 30th (Sunday) at Aberdeen Centre with Fairchild TV news anchor Clement Tang and Fairchild Radio news anchor Debbie Chen as moderators. Six candidates from the three major parties were invited to this debate, and a wide range of topics were covered. The candidates who participated in this Forum included Teresa Wat (candidate in the riding of Richmond North Centre) and Richard Lee (candidate in the riding of Burnaby North) from the Liberal Party, Katrina Chen (candidate in the riding of Burnaby-Lougheed) and Chak Au (candidate in the riding of Richmond South Centre) from New Democratic Party, and Valentine Wu (candidate in the riding of Burnaby-Edmonds) and Saira Aujla (candidate in the riding of Surrey- Green Timbers) from the Green Party. The candidates sparred for the first time on Chinese media, and landed punches during vigorous discussions on the big issues in BC. Media representatives, including News Director of Fairchild TV Mr. Todd Ye, News Director of Fairchild Radio Ms. Travena Lee, Editor-in-Chief of Sing Tao Daily's B.C. edition Mr. Victor Ho, President of Dawa Business Press Mr. Zaixin Ma, and Chief Editor of Global Chinese Press Mr. Raymond Jin, directed questions for the candidates to respond. Debbie Chen (left) from Fairchild Radio FM961 and Clement Tang from Fairchild Television. The representatives from the three parties first elaborated on their platforms, followed by interactions with the floor, as they addressed inquiries on issues ranging from health care, education, oil pipelines, housing and much more on the spot. Each party was pressed to express countermeasures on the greatly concerned U.S. lumber duties on Canadian softwood imports. Some of the most heated exchanges centered on the George Massey Bridge replacement project, Medical Services Plan, and Richmond Hospital patient care tower project. Many from the audience took this opportunity to support their own political parties, and challenge the opposing parties’ platforms. The debated climaxed as the candidates crossed swords on prominent issues in the last confrontation. 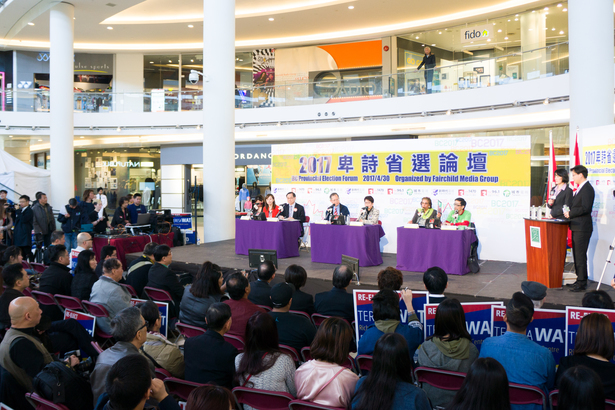 This public forum had not only allowed each candidate to outline and defend their mandates, but also given Chinese Canadians a chance to learn where each party stands on priority campaign topics, and prepare every one of them for their vote on May 9th. (from left to right) Hosts Clement Tang and Debbie Chen, NDP candidates Katrina Chen and Chak Au, Liberal candidates Richard Lee and Teresa Wat, Green Party candidates Saira Aujla and Valentine Wu, with the media panel. 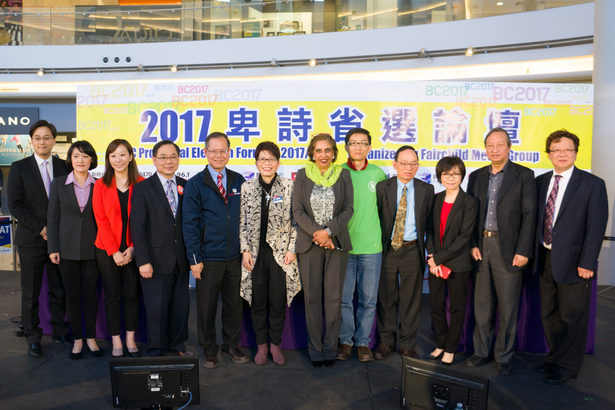 BC Provincial Election Forum 2017 was broadcasted live on FM96.1, and will be aired on Fairchild TV on May 1st (Monday) at 10pm, and Talentvision on May 3rd (Wednesday) at 9:25pm EST.